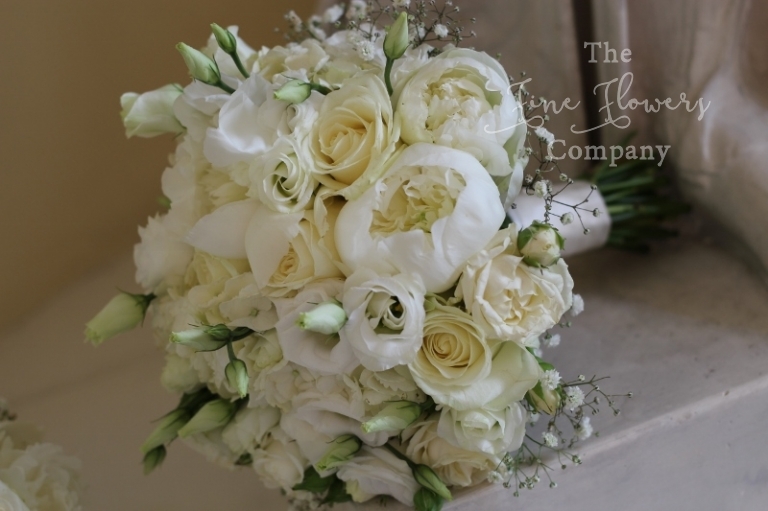 For an all time elegant look, it’s hard to see how these classic white flowers at Botleys Mansion could ever date… It’s such a classic and timeless colour scheme and such an opulent look, I can imagine these wedding flowers to look equally at home today as it might have done 10 years ago. 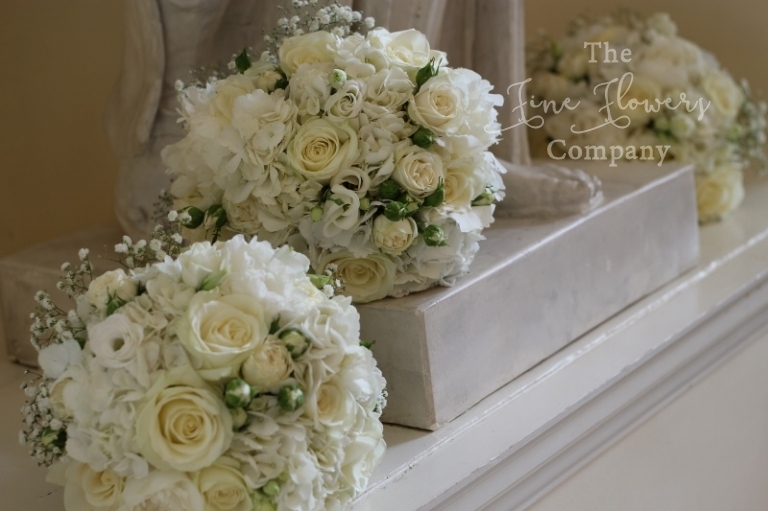 For her wedding at Botleys Mansion, Nikki’s look combined ever-elegant ivory roses with opulent blousy hydrangeas and a scattering of delicate lacey gypsophila, all glammed up with beautiful silver, crystal and mirror elements to complement an ivory and pale silver colour theme. The bridal bouquet and the bridesmaids bouquets were all very dreamy and pure, with a mix of roses, paeonies, spray roses, lisianthus and a subtle halo of lacey gypsophila. They really went so well with the pale silver grey dresses and the to die for grey shoes. The gypsophila look was carried over in the flower girl’s flowers. Nikki’s young flower girl carried a posy of gypsophila and after much convincing, also wore a delicate circlet of lightweight gypsophila. 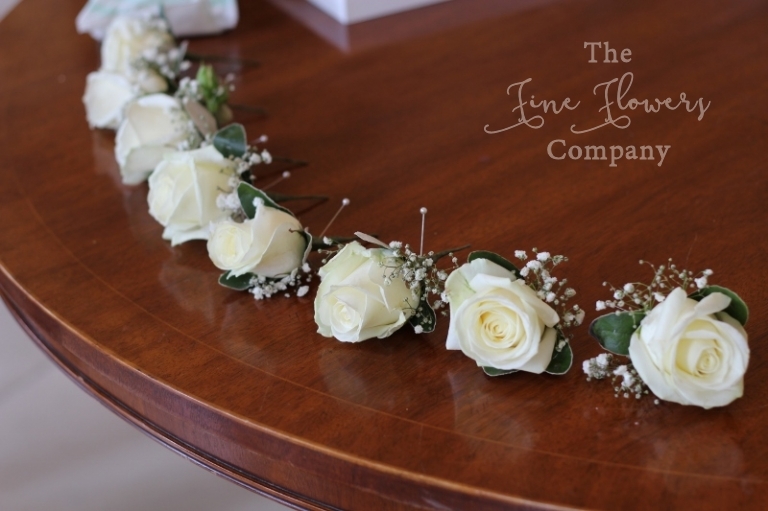 The mens’ buttonholes were all elegant rose versions with a subtle accent of gypsophila. The venue flowers carried on with a really glamorous look for the ceremony and reception centrepieces. Nikki had 9 amazing tall vase centrepieces with really dramatic flower displays of all white roses, hydrangeas and gypsophila, on elegant glass flutes. Since they were so impressive, 4 of them were used first to dress the ceremony area in the Green Room. Two were used at the back and 2 either side of the lectern, placed on beautiful mirrored plinth stands. We gave the two at the front a different twist by adding wreaths of white flowers around the bases of the vases, since these were the main focus of attention during the ceremony. We added extra ambiance with lots of rose petal scatter and candlelit storm vases along the wedding aisle, and dressed the fireplace with a pretty and delicate line up of small vases, bud vases and votives, all with the same beautifully pure white wedding flowers. Finally the pretty vases on the ceremony table were designed to also suit the top table, supplemented by the beautiful bridesmaids bouquets, adding extra flowers on the top table while also keeping all of them fresh to enjoy the next day. 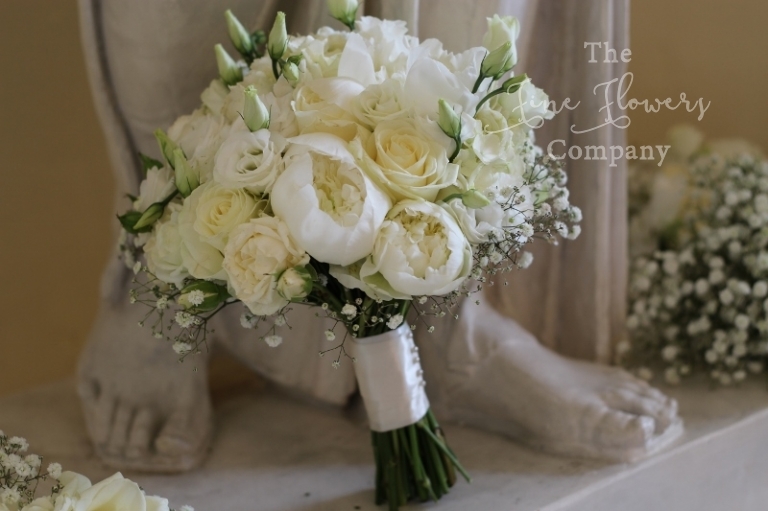 If you are planning your own Bijou wedding at Botleys Mansion, Cain Manor or Notley Abbey, we are familiar with and have done weddings at all these beautiful venues, and would be delighted to help you plan your own Bijou wedding flowers… Please visit our featured weddings venue pages.